Recruiting newborns into cystic fibrosis studies is important to research, but there are no studies into how parents feel about including their recently diagnosed newborns in treatment studies. All infants underwent pulmonary testing between three months and one-year of age. 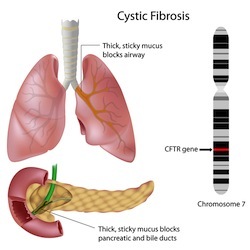 Patients diagnosed with cystic fibrosis underwent additional testing as needed. Questionnaires were distributed to parents at the 3-month testing and at the end of the 12-month period for infants who tested positive for cystic fibrosis. Conclusion: About 86% of the parents of cystic fibrosis positive infants in the study responded positively when asked about participating in the clinical study. The control group, however, was more difficult to recruit. Only 29% of the parents of healthy infants agreed to participate in a study. The overall response from parents of children with cystic fibrosis was positive, which bodes well for research. Source: Chudleigh J, Hoo AF, Ahmed D, Prasad A, Sheehan D, Francis J, Buckingham S, Cowlard J, Thia L, Nguyen TT, Stocks J; on behalf of the London Cystic Fibrosis Collaboration (LCFC). Positive parental attitudes to participating in research involving newborn screened infants with CF. J Cyst Fibros. 2012 Oct 4. pii: S1569-1993(12)00174-9. doi: 10.1016/j.jcf.2012.09.001.